Meet Lucy. She’s your typical brown bear. Fuzzy. Brown. Wears a pink skirt and a pink bow in her fur. One day, while toodling through the forest, she comes upon a little boy whom she promptly names “Squeaker.” Lucy’s mother reluctantly allows Lucy to keep her new “pet” but with the warning that “children make terrible pets.” And, boy, is Lucy’s mom right. Squeaker refuses to be potty trained, ruins the nice furniture and causes general chaos throughout the quiet bear household. 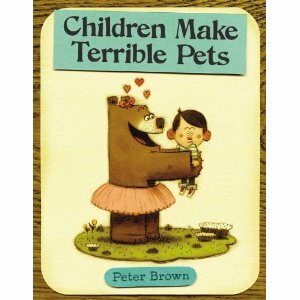 For anyone who has ever thought that your child was at least part wild animal, this is the book for you. It’s utterly adorable and turns the age-old “mama, can i keep him?” story on its fuzzy little ear. A must read.